On the floor, a pattern resembling those made in white sand in gardens at Zen temples is made in lime. Several men wearing nothing but towels wrapped around their waists are sprawled on the floor. 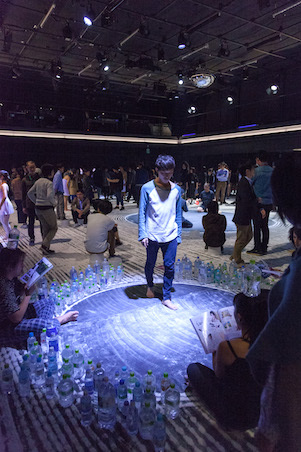 Given that writer and director Luis Garay, who was also invited to the KEX before this one, created this piece during a residency in Japan, it is possible that he has re-imagined the North Hall at ROHM Theatre Kyoto as a dry landscape garden and public bathhouse. Looking around the venue with this thought in mind, I notice there are a number of elliptical or circular areas resembling ponds or bathtubs, each of which is occupied or surrounded by several performers. Placed here and there are plastic stools with holes in the middle like the ones found in bathhouses. Members of the audience wear shoe covers to prevent the lime sticking to their shoes and walk around inside the venue while watching the performance as if visiting a Japanese style garden with a path around a central pond. The result is like a combination of a performance and an installation. Soon after entering the hall I encounter a woman embedded in a low mound. I am reminded of Samuel Beckett’s Happy Days, but this low mound is a replica of Mount Fuji and so perhaps the woman represents a mountain goddess. Behind this sit a group of men and women shouting in chorus a mysterious tune that sounds like a Buddhist chant. They are surrounded by PET bottles containing mineral water and each has a PET bottle on their head. Fashion magazines including Brutus, Men’s Club and CanCam are scattered about, and when I listen more carefully I realize they are all reading aloud separate articles. 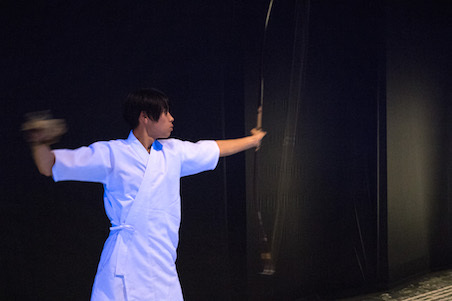 To the left of Mount Fuji and the chanting chorus is a space resembling a Japanese archery range, albeit that the distance to the target is not very far. From time to time (a total of six times if my memory serves me correctly), a young male archer appears and draws a bow. Whenever an arrow pierces the target, a dry crack echoes throughout the venue. At the largest circular “pond/bathtub” in the middle of the venue, two men play ping-pong. I say “play ping-pong” because it would be stretching things to call the exchanges of slow, looping shots a “table tennis match.” Soft electronic music is playing in the background, but it is drowned out by the “chanting” voices and the metronome-like sound of the ping-pong ball. Despite the fact that it is not actually a bathhouse, I felt as if there was steam everywhere. Immediately to the right of the chanting men and women, four young women who appear to be in their early teens are practicing ballet. Lined up facing the wall, they slowly repeat the same basic movements. I almost expect to hear a voice saying “one, two, three…” Next to this, a man is being treated with acupuncture. 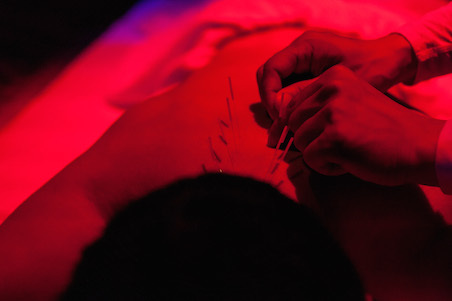 The acupuncturist is likely a professional. He is actually inserting needles into the man, who is lying on a bed looking as if he is thoroughly enjoying the experience. Behind this, a man endlessly performs a series of movements that could be either dancing or stretching in front of a small electronic scoreboard. Displayed on the electronic scoreboard is an uninterrupted stream of mysterious text resembling an SNS chat. 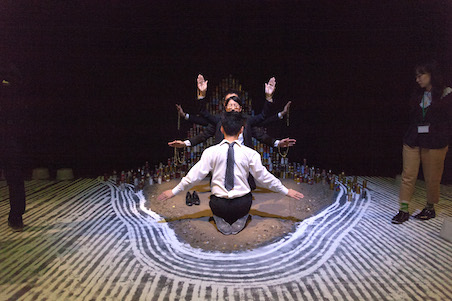 To the right of this, at the very back when viewed from “Mount Fuji,” in a space partitioned off by numerous coins arranged in the shape of a toilet seat, four men and women repeat a series of curious movements akin to coordinated group gymnastics. All are dressed in suits like those worn by Japanese salarymen. Attached to their spectacles are five-yen coins. On the wall behind them, a flame-shaped ornament is displayed like a Buddhist altar, but when I get closer I realize it is actually made out of empty coffee cans piled up to around the height of a person. In front of it stand two women performers, one wearing a suit and the other wrapped in a bath towel. 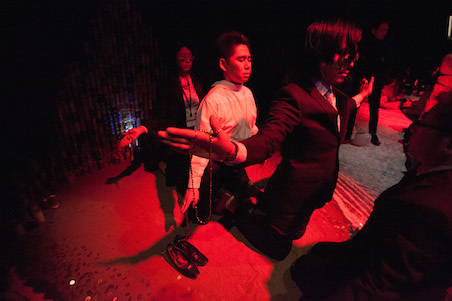 After a while, the woman in the suit collapses onto the floor, where she remains until the end of the performance. I am reminded of Beckett’s short story The Lost Ones. It tells of two hundred lost bodies, each searching for its lost one, roaming a confined space “[v]ast enough for search to be in vain. Narrow enough for flight to be in vain.” The low mound may have been Mount Fuji or it may have been another volcano, but I remain convinced it was a reference to Happy Days, in which case it may have symbolized a Beckett-like worldview. At the back of the venue, right next to the “wage-slave dance,” was a door leading back stage. A male performer entered and exited through this door several (if I remember correctly, four) times. This “visitor” from “the outside,” which was strongly illuminated from behind and therefore difficult to see from inside the venue, pulled a trolley case and to begin with wore a suit and tie. On his second appearance the tie had been removed and the buttons on his suit and shirt were undone. On his third appearance he wore only bikini briefs. On his fourth appearance he was, as expected, completely naked, but he also carried on his back a large egg-shaped object. With eyes wide open, he slowly walked around the venue before exiting through the same door with the dazzling light through which he had entered. Perhaps this was the alter ego of the artist visiting Japan from abroad. If so, the egg may have been a metaphor for this work. This scene was unnecessary. I thought it could have ended after just three appearances. But perhaps an ending does not “absolutely have to be.” After all, everyday life in this country (in this world) drags on and on lazily, endlessly repeating. So if possible, rather than ending after 100 minutes, perhaps this work should be performed around the clock forever in parallel with the real world. We live in a reality that is comfortably warm like a public bathhouse, beautiful yet empty like a garden at a Zen temple, and far removed from the outside world. When I went outside after the performance had ended, my body shivered as if I was feeling cold after a bath. *El lugar imposible made its world premiere on October 28, 29, 30, 2016 at the North Hall, ROHM Theatre Kyoto. Written, directed and produced by Luis Garay. Co-produced by KYOTO EXPERIMENT. This review was written based on the October 29 performance.